It is apparent that there are several coats of paint and that the paint is worn. 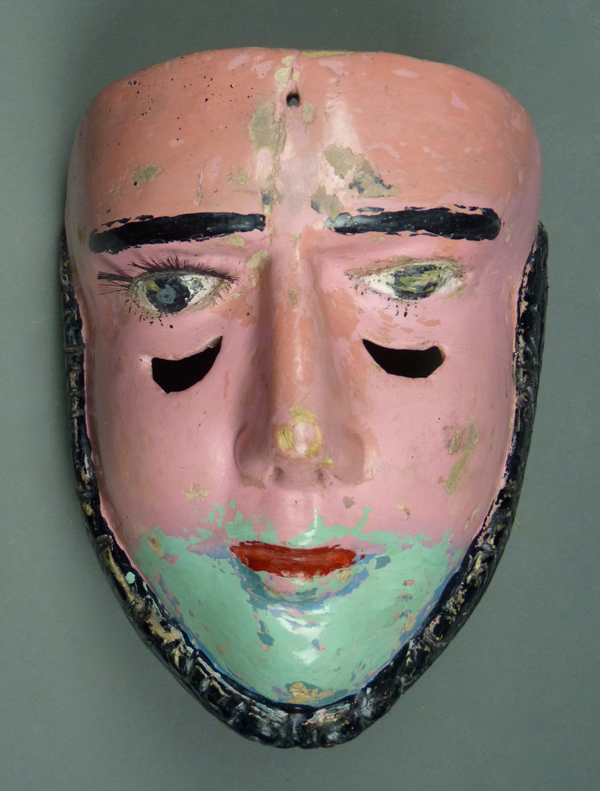 This mask is 8½ inches tall, 6 inches wide, and 4 inches deep. Crescent shaped openings under the eyes allow vision. This is another element of the usual design. 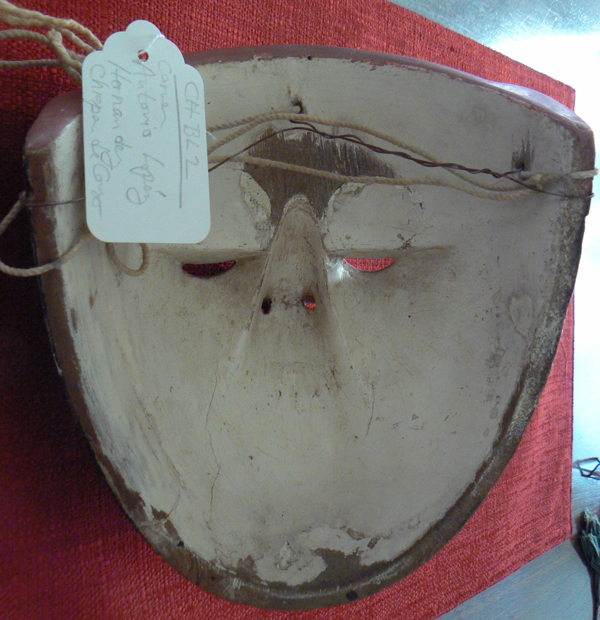 The back of this mask demonstrates marked wear along with minor damage. The Parachicos dancers shake rattles that are handmade by a tinsmith. 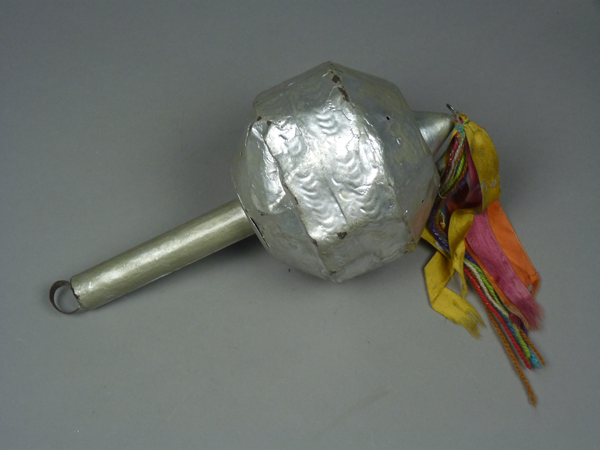 The overall length of this rattle is 11 inches and the hollow chamber is 5 inches in diameter. Not only do the Parachicos dancers perform to celebrate several important Christian saints, but also they dance to honor an important 18th century patron and her son (el chico). Here is a summary of that history or legend. In 1711 a wealthy woman of Spanish descent, Doña Maria de Angula, brought her son to Chiapa de Corzo seeking his cure from some debilitating illness. A curer had the boy immersed in the water of a local river or lake and the townspeople danced in his honor. He was suddenly cured. Doña Maria sponsored a fiesta to celebrate her son’s recovery and so the dancers are said to dance for “the boy” (para el chico). During a later crop failure Doña Maria provided money for food to combat a famine. Here are two links to expand on these explanations—one from Unesco and another from the Huffington Post™. Here is a second Parachicos mask. 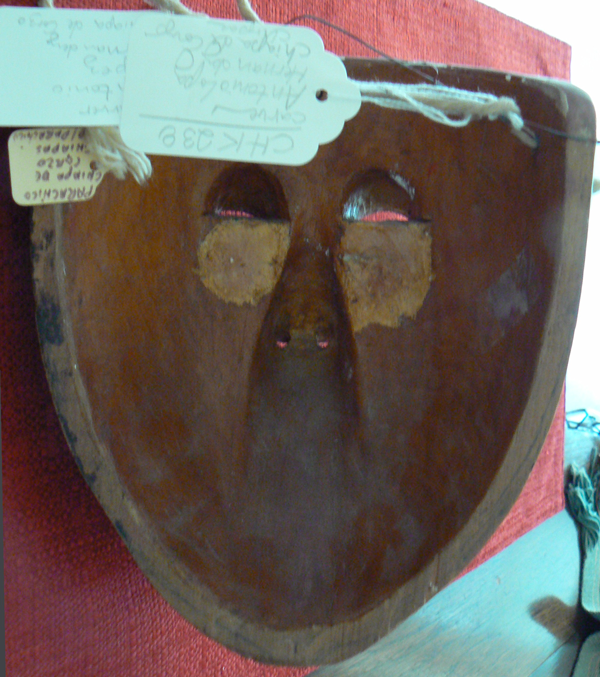 This one has a snouted mouth, a characteristic that became common for the Parachicos masks made in recent decades. 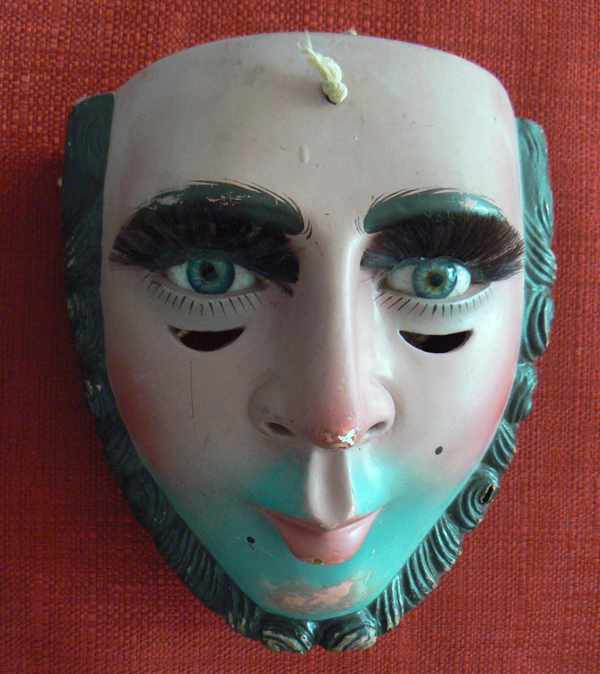 The mask has glass eyes, and the right eye is broken. 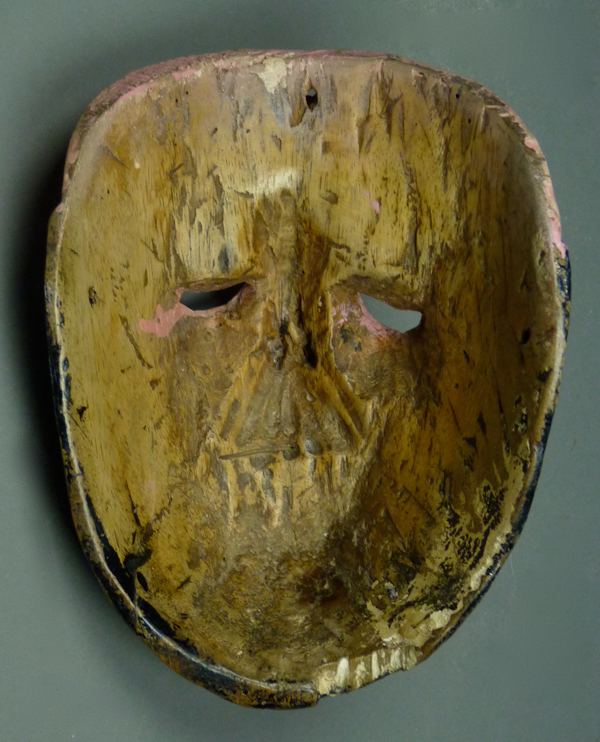 This mask is 9 inches tall, 6 inches wide, and 4 inches deep. In the past the chin was repaired. It would seem that this mask has had rough treatment. On the other hand, the contours of the this back demonstrate the design that is associated with a famous mask carver, Antonio López Hernández of Chiapa de Corzo, Chiapas. 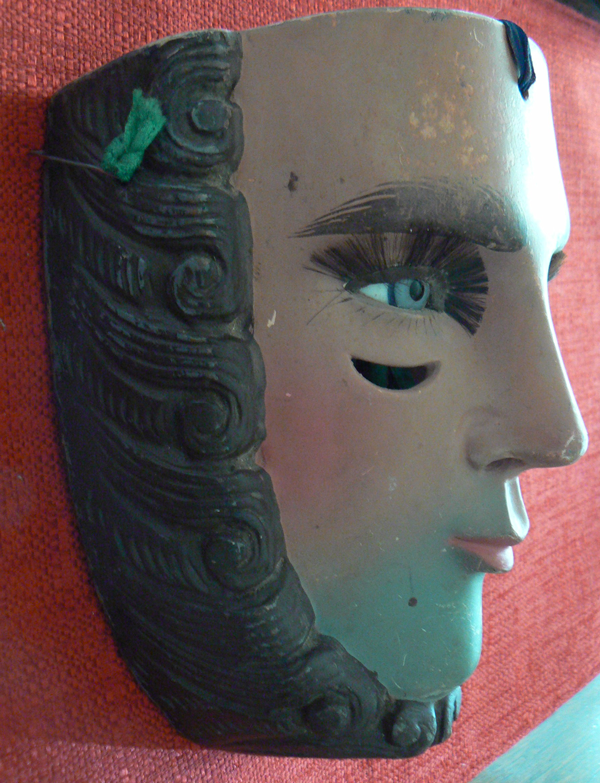 These contours will be more obvious in several detailed photos of other masks, later in the post. Antonio was honored in the book Great Masters of Mexican Folk Art From the Collection of Fomento Cultural Banamax (pages 260-263). 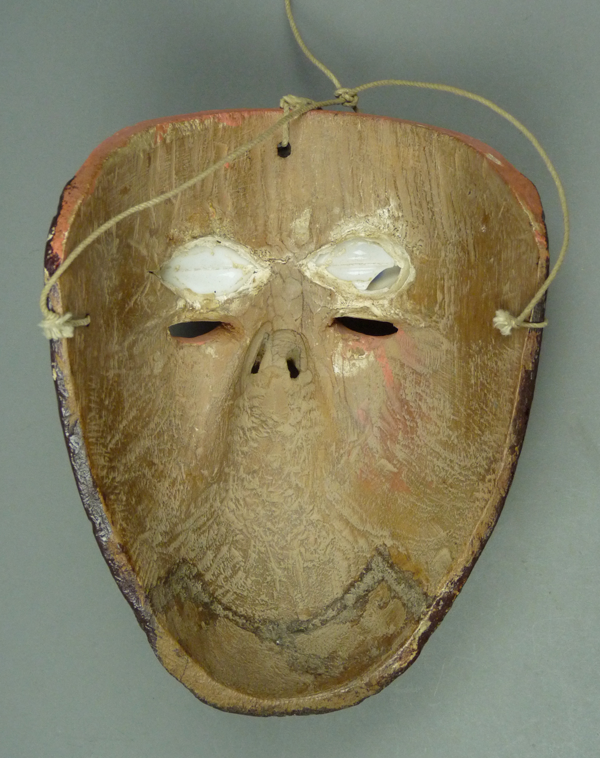 I will include photos of masks that are very similar to those in the Banamax book. 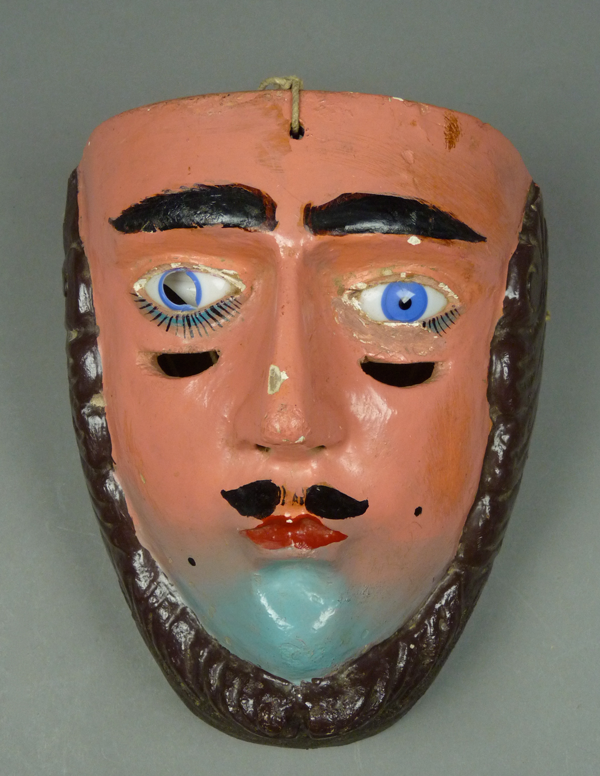 I should point out that there are Parachico masks currently coming out of Mexico that mimic the style of Antonio López Hernández, yet they miss the mark. They lack the precise carving of Antonio’s work. If one wanted to buy one of Antonio’s masks, they would be wise to chose according to a high standard of excellence. 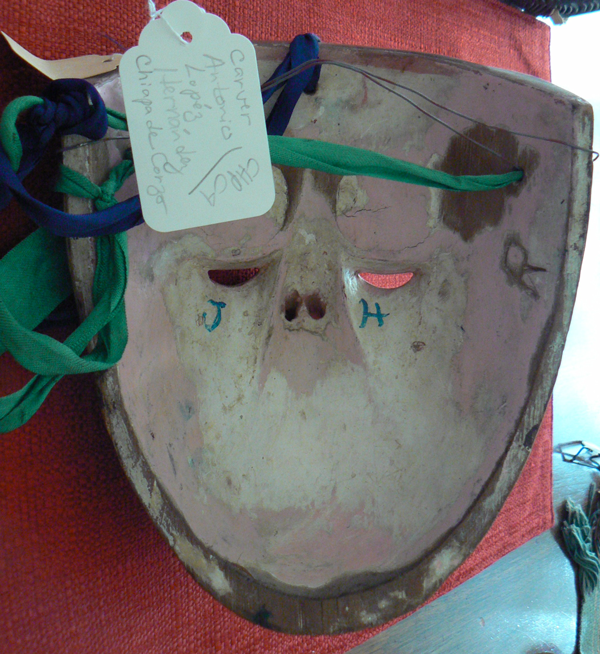 The next mask was obtained from the collection of Jaled Muyaes and Estela Ogazón. On this mask the snouted mouth is even more refined than on the last mask. The face has an olive complexion. 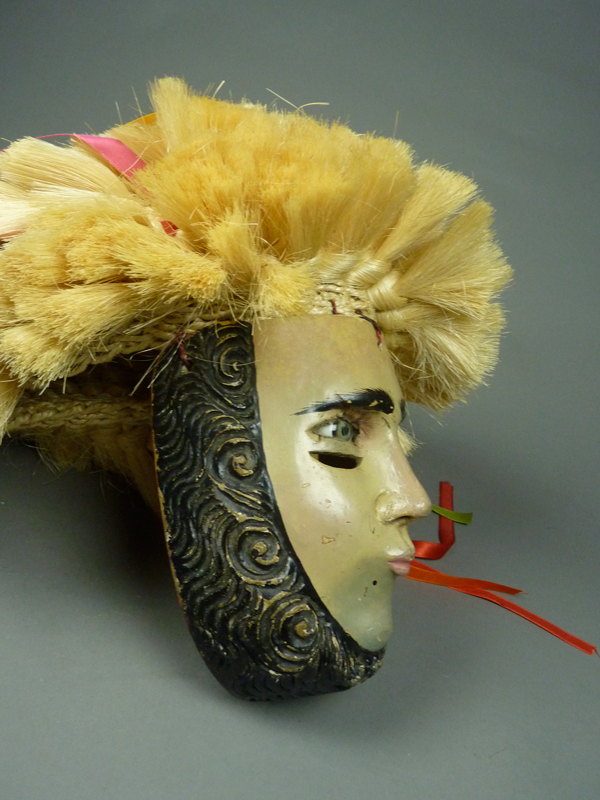 This mask is 7 inches tall, 6¼ inches wide, and 4 inches deep. 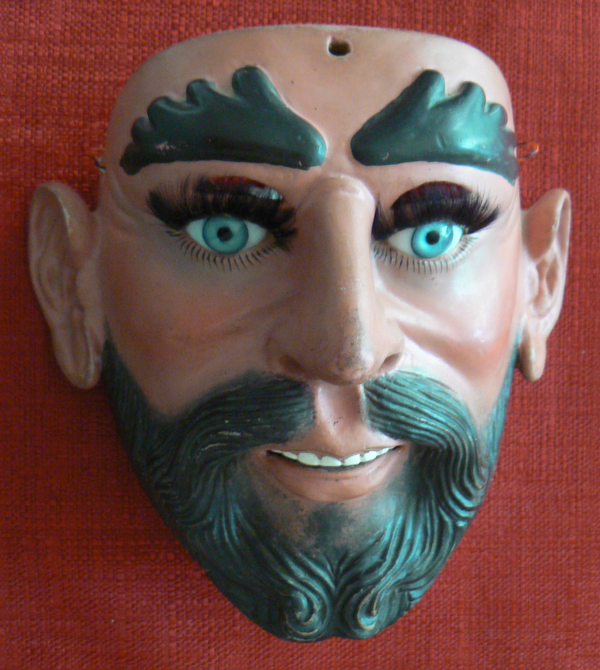 The ring of facial hair that frames the mask has been carefully and elaborately carved. 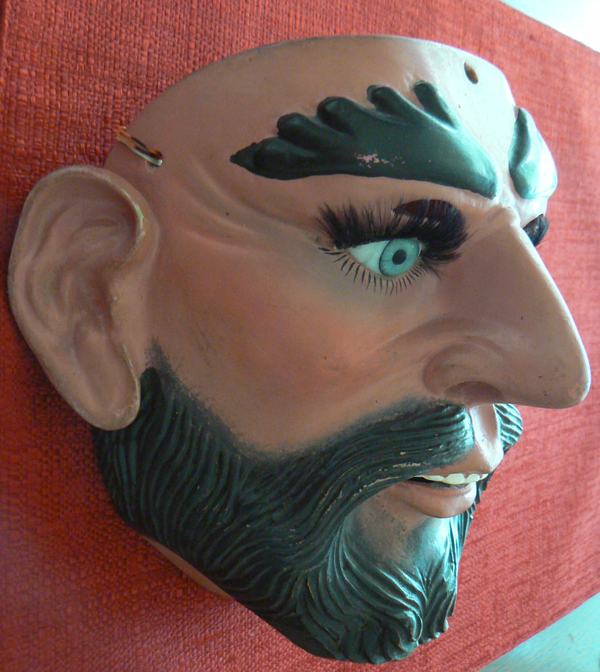 The back of this mask also demonstrates the design used and apparently introduced by Antonio López Hernández. 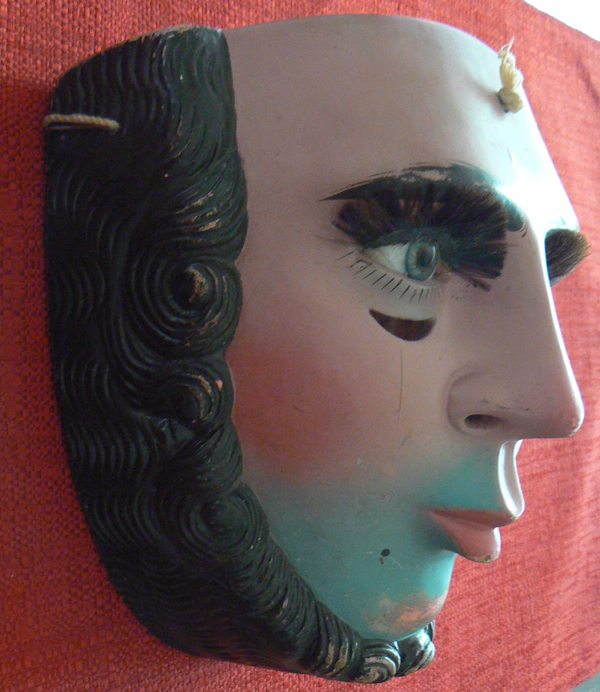 His masks tend to have painted backs, as seen in this case. 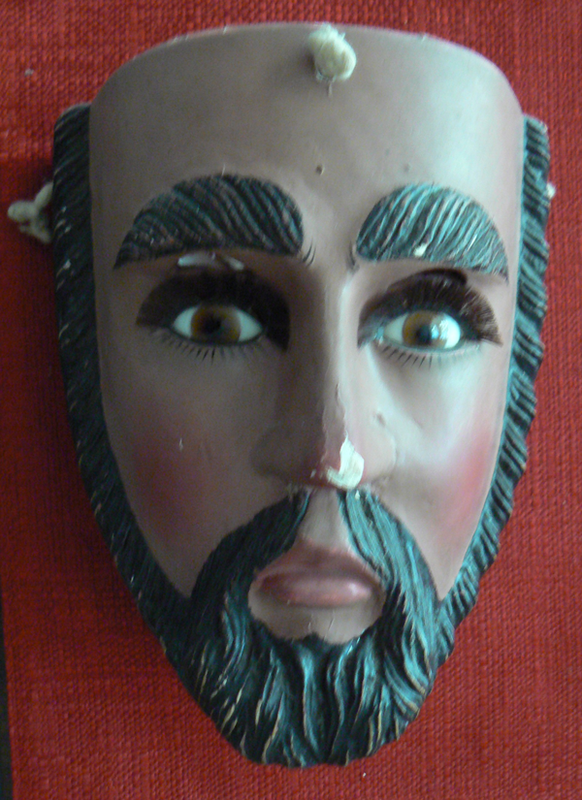 The next four Parachicos masks are from the collection of Charles Thurow and the late Dale Hillerman. The first three demonstrate typical design features of Antonio López Hernánez. I lack measurements for these masks but they are very similar to the last mask in size. 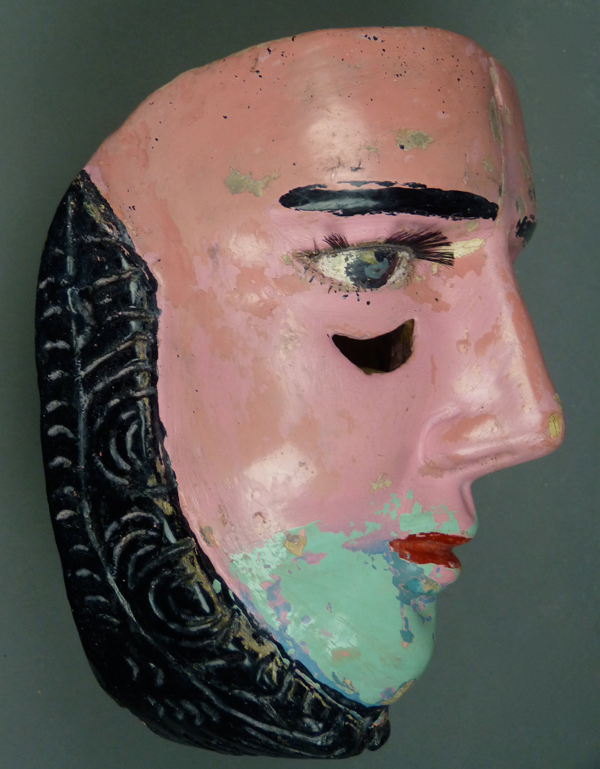 This mask is exquisitely carved and carefully painted. 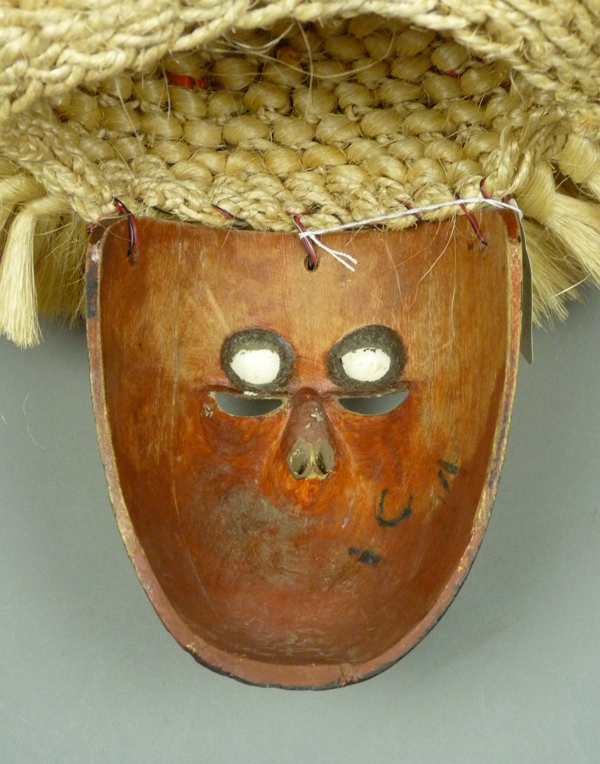 Although one of the masks has a painted mustache, it is clear that the standard Parachicos design lacks that feature. These photos provide a particularly clear view of the elegant back design on the Parachicos masks carved by Antonio López Hernández. The most striking aspect is the hairpin shaped ridge that frames a space for the dancer’s nose and simultaneously forms the edges of gutter shaped spaces for the dancer’s eyes. You will see exactly the same design details in the photos of the mask that follows. Here is another similar mask. Here is that same back design. 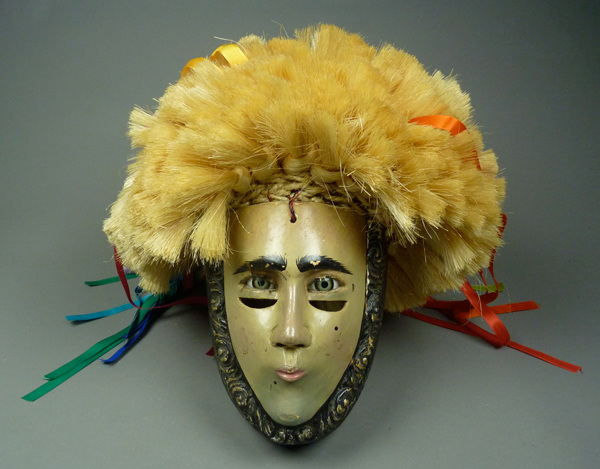 The last two masks from the Hillerman Thurow collection were worn by the Patron (Master) of the Parachicos dancers. 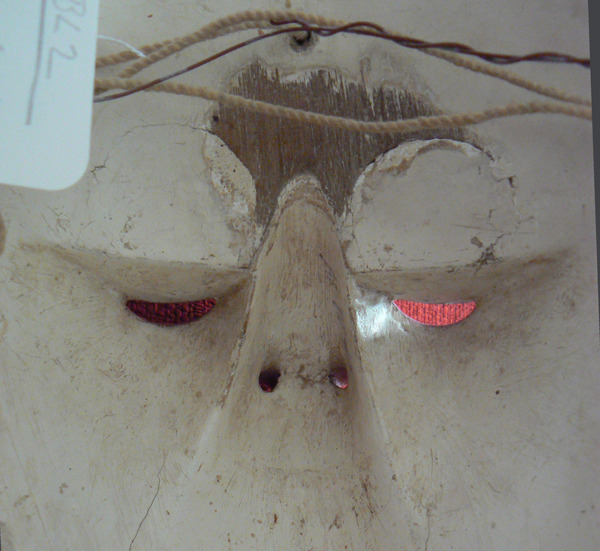 Note that these masks have vision slits that are nearly hidden, just above the glass eyes. On this next mask we can see Antonio’s usual layout on the back, but adapted to the change in the placement of the vision openings. The Patron masks have elaborate mustaches that are carefully carved in relief. The level of carving is wonderful. 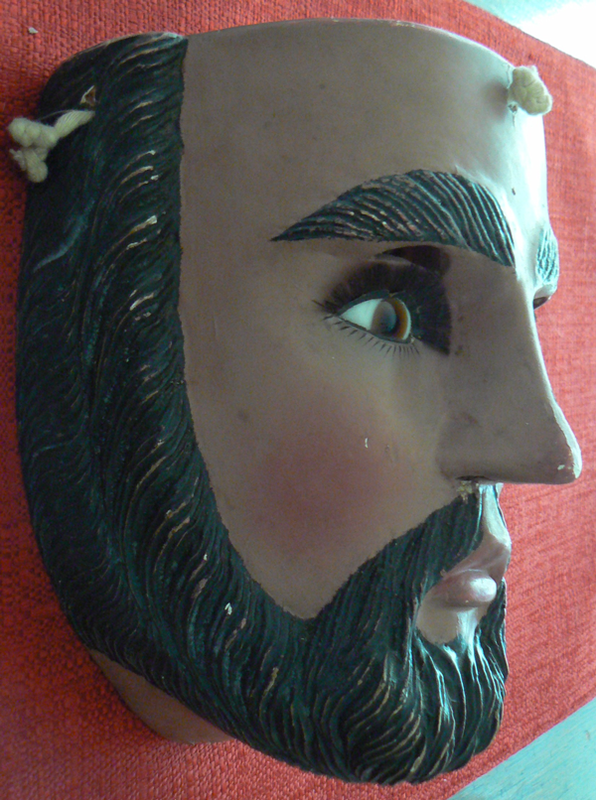 The hollow areas on the back of this mask are identical to those on the other masks by Antonio, even though the embedded glass eyes and the vision openings have exchanged places. 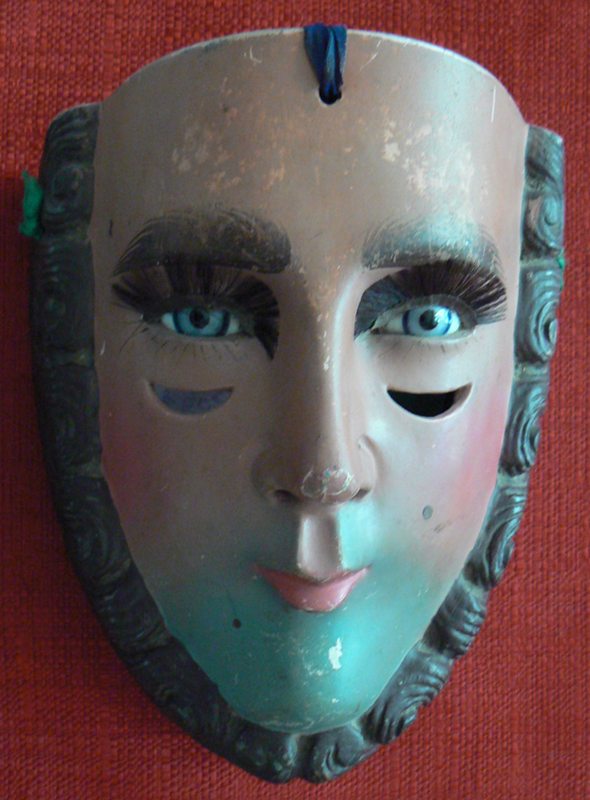 The fourth mask from the Hillerman Thurow collection, another Patron of the Parachicos, has prominent ears and the back design is quite different. 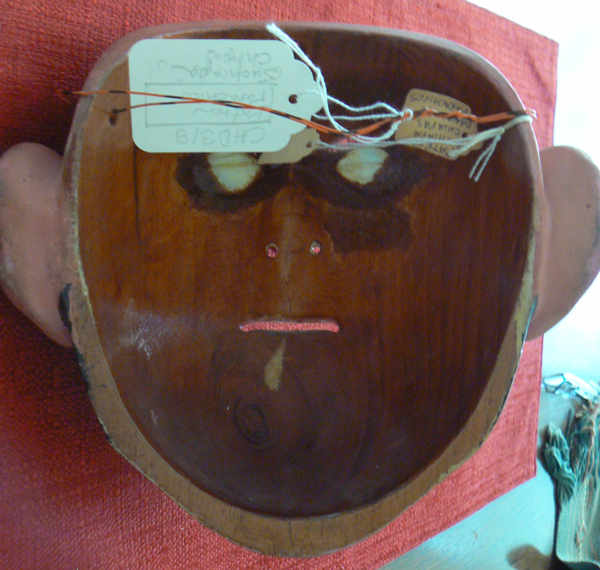 This mask was collected in Suchiapa, Chiapas, and was evidently carved by another carver than Antonio. The carving of this beard and mustache is very fine. Just look at this gigantic and carefully carved ear. 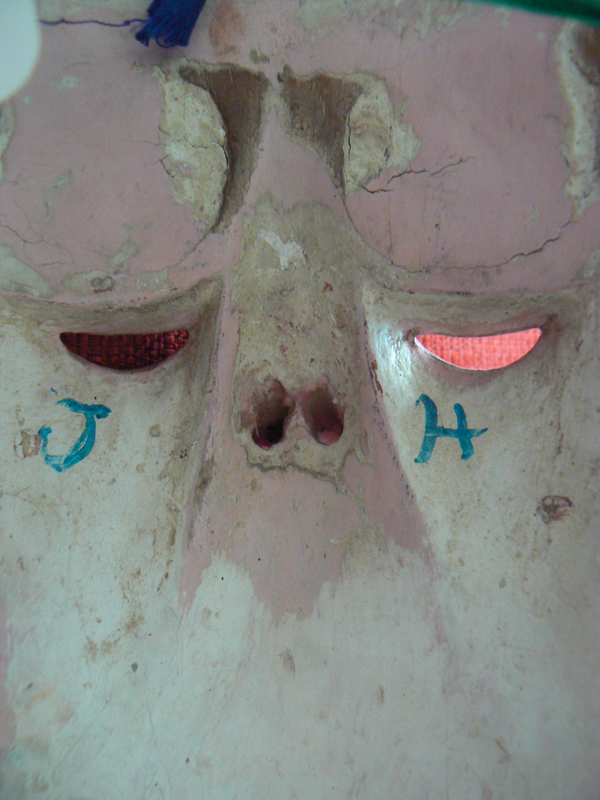 This well worn mask was carved in Suchiapa. The difference in the back design is obvious. I hope that you have enjoyed seeing these Parachicos masks. 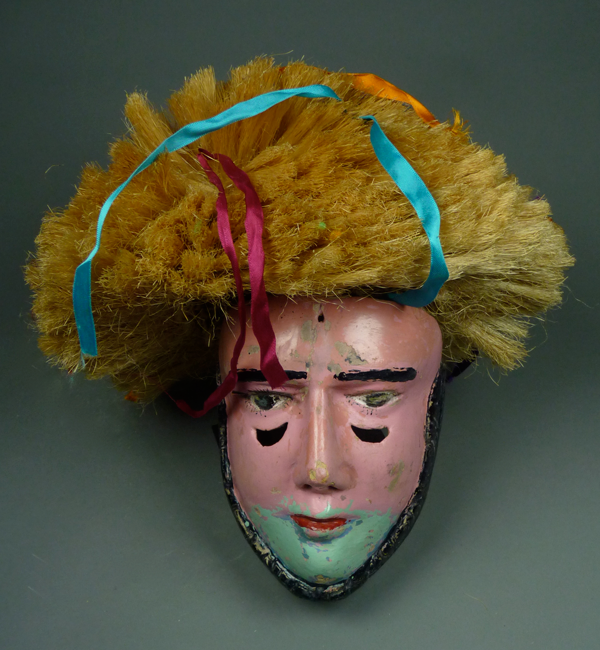 Next week I will write about some related masks from Chiapas. 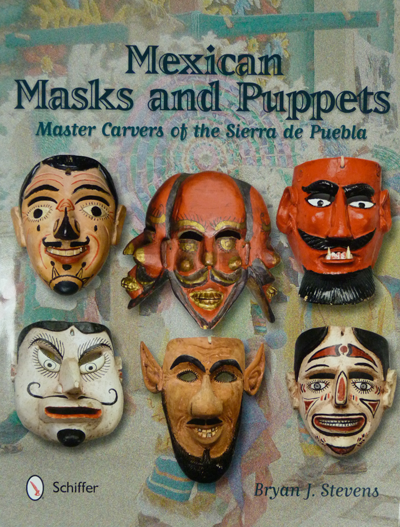 Thanks for the wonderful display of mostly older Parachico masks examples of which I had not seen. The last one with the flaming eyebrows reminded me of some Guatemalan Masks Also the link to the unesco tape was great. Thanks also providing some detailed info on the actual celebration/dance. 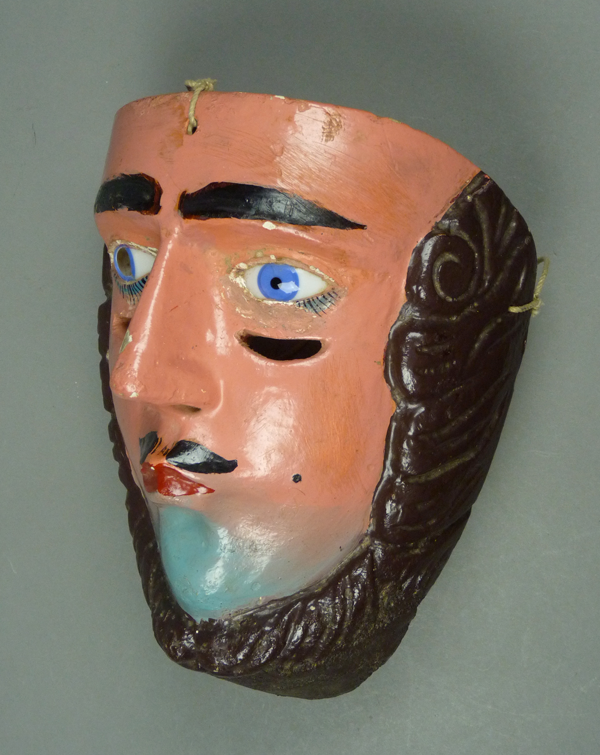 To celebrate the first full year of my blog, I am about to launch a several month’s long series on Guatemalan masks. In prearing for those discussions, I too noticed the similarity in the eyebrows between masks in Chiapas and Guatemala. As I will explain in several weeks, there are very good reasons for these similarities.